Chris Colfer is another one of those celebrity-turned-writers that I was initially sceptical of when it came to his Land of Stories series but quickly proved me wrong. As I’ve witnessed Colfer grow as a writer over the past few years he has become a firm auto buy author for me. Going back to his old roots, Colfer returns to the Young Adult age range with Stranger Than Fanfiction with a story following a group of teenagers, about to go off to college, who decide to go on a road trip. Their bond exists through their mutual love of a sci-fi TV show called Whizz Kids, fronted by heart-throb Cash Carter. As the group set off on their final adventure together before college, they invite their favourite actor along not thinking for one minute that he might actually say yes… until he shows up. Stranger Than Fiction is fundamentally like every other road trip style novel you’ll come across. It’s formulaic to the point where some landmarks visited are ones I’ve seen in countless other books. So that aspect left little to the imagination. Colfer’s overall flair remains throughout but I was left disappointed: none of the characters really stood out for me despite the depth of their backstories, except for Cash Carter who is the real driving force for the plot and the only really interesting part as you get to see what really goes down on the other side of a media story. This is a tale about identity, friendship, final goodbyes and making memories that are sure to last forever. Like probably many of you, I first discovered Chris Colfer in the hit American TV show Glee. It was my admiration for his work ethic and his focuses outside of Glee that led me to The Land of Stories series. I adored the first book. The creativity and twists on classic fairy tales such as Red Riding Hood were so refreshing to read. 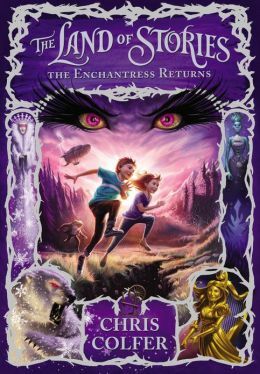 I finally muddled through my TBR (to be read) and reached the second book in the series titled The Land of Stories: The Enchantress Returns. Truthfully, I was nervous going into this book. The first book, The Wishing Spell, was so good that I was worried that this book would fall below my expectations. Which sadly tends to happen a lot with a series. (See Mockingjay in The Hunger Games series) I wasn’t sure how much this initial idea could expand and it was a long book to say it’s 9-12 fiction – the edition I read was 517 pages. But praise the literary Gods for Chris Colfer did not let me down. This book was perfectly paced: no parts felt like they were rushed and none felt like they were dragging. The twists on each fairy tale had me in awe over Colfer’s clever mind. The writing didn’t feel as solid for me as in The Wishing Spell but the plot was on point, which made up for the writing. The driving plot focus of The Wishing Spell , for those unfamiliar to the series, was in fact… the wishing spell, which is a kind of portal to the real world. Protagonists Alex and Conner Bailey have to take memorable things from each kingdom to build it, in order to return home. For example, Cinderella’s glass slipper is one of the objects they have to obtain. In this book, just as the title suggests, The Enchantress is back and she has a whole lot of vengeance to dish out. When Alex and Conner’s mother is kidnapped, they find themselves back in The Land Of Stories trying to save her. To destroy The Enchantress, Alex and Conner need to build “The Wand of Wonderment” which is made out of the six most prized possessions of the six most hated people in the world (ie the villains). I liked the villain aspect being the plot driving force. It was nice to see them more involved than just the single baddie the protagonist has to defeat. There is a third book in the series titled The Land of Stories: A Grim Warning and Colfer is currently working on a fourth book. He also has a Young Adult book out called Struck By Lightening which has been adapted into a film starring Chris Colfer himself.